1 Charles Perkins Centre, School of Molecular Bioscience, University of Sydney, Sydney, New South Wales 2006, Australia. 2 Garvan Institute of Medical Research, Darlinghurst, New South Wales 2010, Australia. 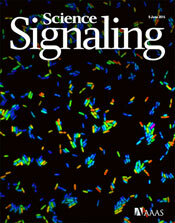 3 Department of Proteomics and Signal Transduction, Max Planck Institute for Biochemistry, Martinsried 82152, Germany. 4 Thermo Fisher Scientific, Cambridge, MA 02139, USA. 5 School of Medicine, University of Sydney, Sydney, New South Wales 2006, Australia. B. L. Parker, G. Yang, S. J. Humphrey, R. Chaudhuri, X. Ma, S. Peterman, and D. E. James, Targeted phosphoproteomics of insulin signaling using data-independent acquisition mass spectrometry. Sci. Signal. 8, rs6 (2015).